By this time of year I would gladly yield to an early spring and forgo any additional sled-riding adventures with the kids, but realistically-speaking, we've still got a month (or two) of winter's chill ahead of us. That being said, I have a tip that makes me feel all warm and fuzzy inside despite the inevitable cold weather outside, and I'd love to share it with you. On the inside of our small hallways closet, I've hung an inexpensive plastic shoe organizer. 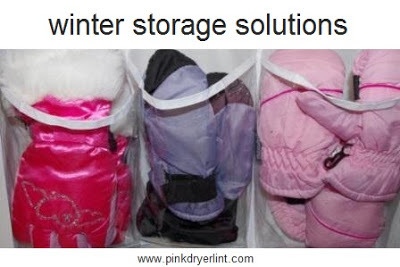 Each pouch is the perfect size to hold a pair of gloves, a rolled up scarf, or a few winter hats. Our winter accessories get placed higher, while the lower pockets are reserved for the girls so they can find (and hopefully, stow away) their own things. As the winter unfolds, I'll admit that the organizer can look like a disorganizer with scarves dangling from the pouches like droopy garland and mismatched and mateless gloves haphazardly jammed together. Still, it beats the alternative, which is having these things scattered across the floor. The best part? It's a closet. You always can close the door to a closet. That is really a great idea!!! Thanks, Kat -- glad that you like it! Oooh, it's not everyday that someone calls me resourceful. Thanks, KC!